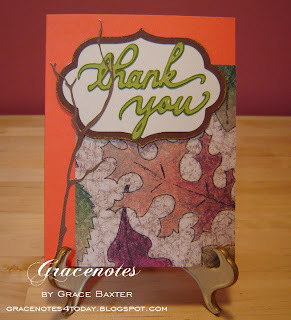 Here are my latest "Thank-You" fall cards. For some reason, they seemed to take a long time to finish. I had so many ideas rolling around in my head, I couldn't decide what to do. I started by using some purchased plain note cards. I bought them at Target and they were super cheap. The packaging was damaged but the cards inside were fine. They even came with matching envelopes. I loved the bright cheerful orange, which lends itself so well to adding all the other fall colours. 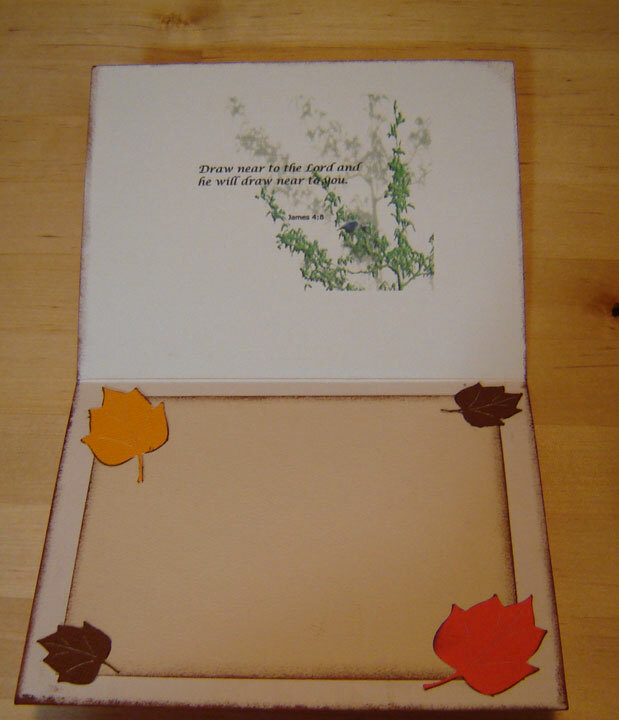 For the first card, I cut a panel from fall leaves paper. 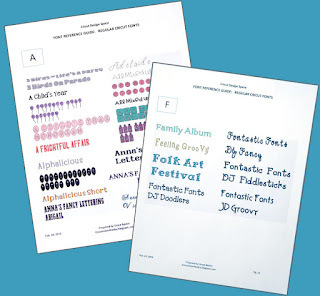 This paper came as 8-1/2x11 and you use less than a quarter sheet for each note card so it is very economical. I really like the look of chipboard and make my own from several layers of white cardstock, 65 lb. purchased at Staples. I cut the frame from cream cardstock at 2.5 using the Home Decor cartridge and layered a brown border from the same shape. I inked around the edge of the brown border using bronze metalic ink. 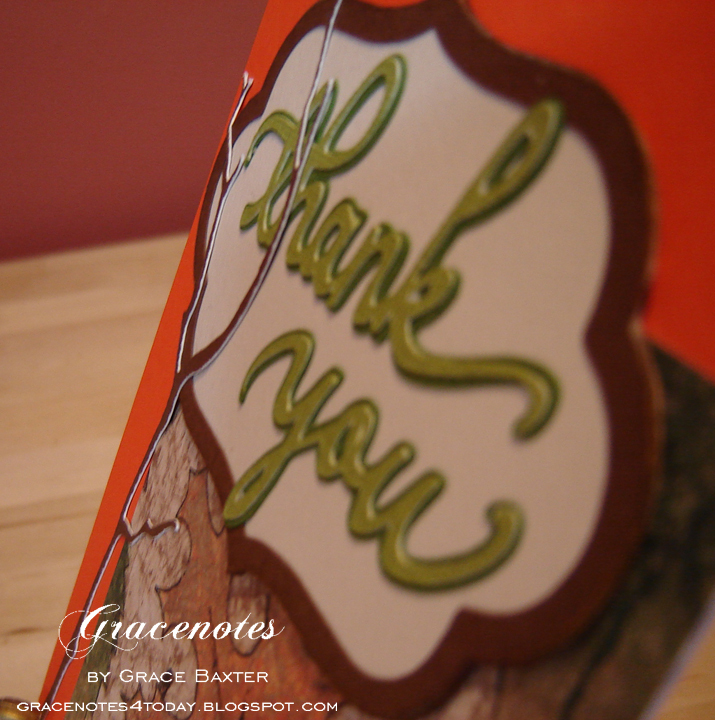 The "thank you" sentiment was cut and shadowed using Beyond Birthdays. I cut the tree branches from Home Decor at size 2.5. The inside of the card is blank. 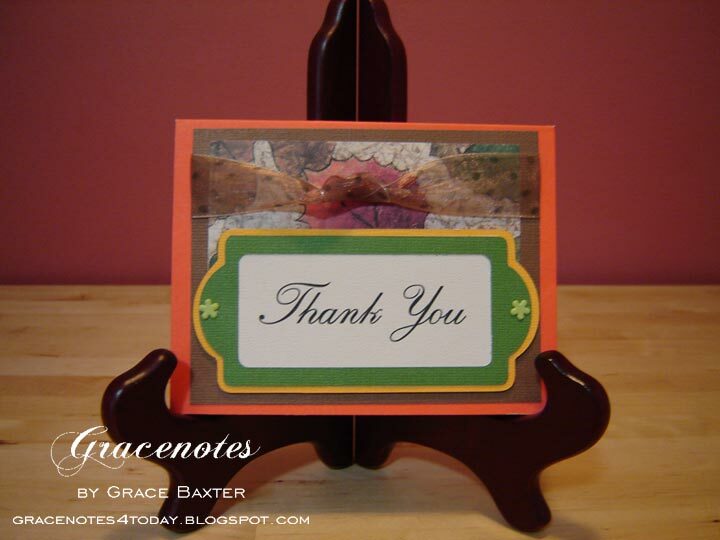 The second card is also a "Thank-you" card. This one is horizontal. Using the same orange base card, I created several layers for the front. The first is brown. On top of the brown I placed a small rectangle of the leaf paper described above. Then I tied a sheer knotted ribbon around the entire brown card, taping it at the back. I love this shimmery ribbon! The most time-consuming thing to make was the sentiment panel. After trying several cuts with the Cricut, I decided to make the sentiment on my computer, using the Renaissance Script font. I printed the sentiment on cream textured paper and cut it to fit my bookplate. Using Fabulous Finds, I cut bookplate 9 from green stock, then shadowed it with goldenrod, both cut at size 2. Next, I assembled the three layers of the bookplate and added brads and some dimensional pops. Inside: The graphic (top panel) was created on my computer. The bottom panel is cream with edges inked in brown. I added leaves cut from Stretch Your Imagination, at size 1 and 1.5. Hi Grace! Thanks for stopping by! Love your bargain find cards and what you did with them! Very clever to make your own chip board! I love these and love that you decorated the inside so pretty! Have a blessed weekend! Hugs!